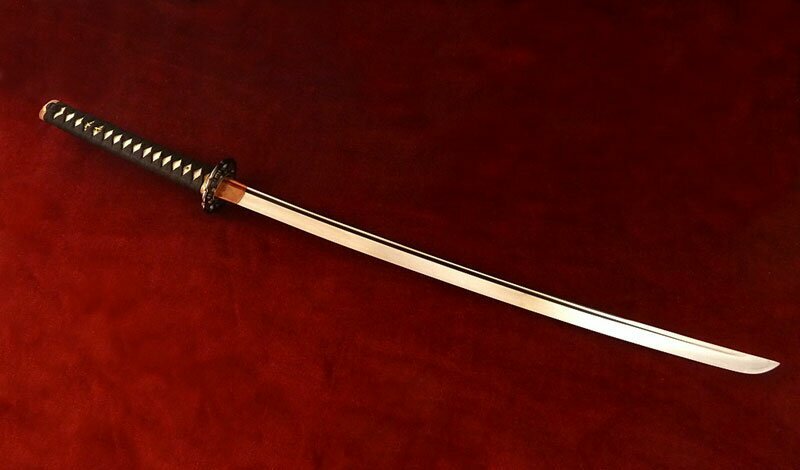 Citadel Katana Super Yagu Plus(CDK5) Katanas for tameshigiri, forged, sharpened and polished in traditional way. Differentially hardened with authentic hamon. Beautifull Shinto blade with grooves. DNH7 steel, hand forged on a charcoal bed. True selective clay temper. Hand sharpened, hand polished DNH7 high carbon steel blade with true differential quenching. Genuine white rayskin handle with black silk cord wrap. Black finish handmade iron tsuba. Black lacquer finish wood scabbard. Habaki : grooved, tempered clay, forged on its blade. Tsuba : aged iron n° 4A, Sukashi, Kiku Gata. Tsuka : 11.14", white Same, brass lizard Menukis, bamboo conical Mekugi, solid bronze Fushi-Kashira engraved en-suite with vegetal designs on a Nanako style back ground, high grade Japanese silk Tsukaito braided in Ineri Maki, filed brass Ito Domes. Saya : Jackwood; glossy, smooth, black lacquer. Kurigata, Koigushi, Kojiri are made of water buffalo horn. Filed brass Shito Domes. Menuki and Fushi Kashira are "lost wax" cast.